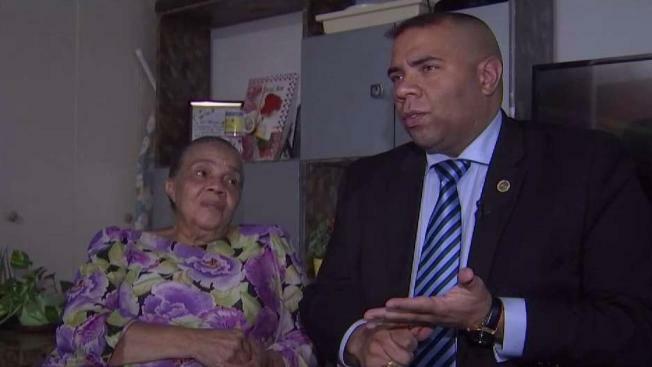 Senior citizens in a Manhattan building, including one elderly amputee, say their landlord is taking too long to fix a broken elevator, especially since the building just won a lucrative tax exemption. Chris Glorioso reports. Senior citizens in a Manhattan building, including one elderly amputee, say their landlord is taking too long to fix a broken elevator, especially since the building just won a lucrative tax exemption. Late last month, the owner of 441 East 155th Street sent elderly tenants a letter warning that, due to fraying cables, the building’s elevator would have to undergo repairs that could last "approximately two to three months." Now it has been nearly a month since the elevator was operational, and mobility-challenged senior citizens are complaining. "I’m 77 years old. I’m handicapped. I can’t continue like that," said Rafael Castillo, a resident who walks with crutches or a prosthetic due to an amputated leg. Oswald Denis, whose mother walks with a cane, says it is unacceptable to let senior citizens go without an elevator for up to three months – no matter how complex the repair. “Elected officials and management, they have failed us miserably - failed our senior citizens in this building,” Denis said. “We are fed up. We want some services and we want it now." Last summer, the New York City Council approved a discretionary tax exemption that allows New Vision Community Redevelopment, the building’s owner, to continue paying steep discounts on property taxes. For decades, New Vision and previous owners of the property have taken advantage of those tax breaks in return for the promise of providing quality affordable housing to low-income senior citizens. But some are skeptical the proceeds of the tax breaks are being spent with only the welfare of seniors in mind. “Even though there is a tax break, the building is not providing our senior citizens what they need,” said Denis. As part of the tax exemption deal, New Vision plans to construct new housing units using the “air rights” above the building. Those housing units could benefit from the reduced tax obligation that applies to the parcel of land beneath. New Vision has not yet revealed how many of those new units would have discounted rental rates for seniors, and how many could be market rate apartments. A spokeswoman from the New York City Department of Housing Preservation and Development, one of the agencies that would have to approve any such development, said talks about the air rights development are in early stages and there aren’t any firm details on how many future units might be market rate. After a call from the I-Team, New Vision gave a revised timeline for the elevator repairs. Instead of projecting two to three months to fix the broken elevator, property manager Miriam Rodriguez sent an email with a one- to two- month repair timeline. She also stressed that the building took early steps to help mobility-challenged seniors who would be inconvenienced by the elevator outage. “We offered accommodations to the residents that requested or need assistance with daily activities that have been impacted by the inoperable elevator,” Rodriguez wrote. Those accommodations included hiring employees to help tenants bring groceries up and down stairs and offering apartments on lower floors to tenants who use wheelchairs. Rodriguez also said the building has kept its end of the tax break deal, by upgrading kitchens, bathroom tubs and sinks, and closets for senior residents. She said an elevator overhaul was always in the plans for this building, but the fraying cables gave the owner little choice but to fast-track the work.